Summary: Written for the 60th anniversary of the tragic 1958 fire at Chicago’s Our Lady of the Angels school that killed 92 students and 3 teachers, this book traces the fire from the first moments it started in a garbage can until it raced up a waxed wooden staircase and quickly engulfed classrooms on the second floor. The author interviewed a number of survivors, all of whom were in large classes (up to 60 students) supervised by a single teacher, usually a nun. Often, they had to make a fast choice whether to stay in a smoke-filled classroom, hoping help arrived in time, or jump out of a second story window. Almost everyone lost siblings, cousins, or friends, yet the students were discouraged from talking about their grief for many years afterward. The fire gained national attention and led to many changes in how schools dealt with fire safety. Includes a section on what to do in case of fire, as well as a list of additional resources. 176 pages; grades 5-8. Pros: This is a compelling, if horrifying, story that grabs readers right away and holds their attention as the narrative moves quickly, along with the fire, from one classroom to the next. Includes plenty of photos. 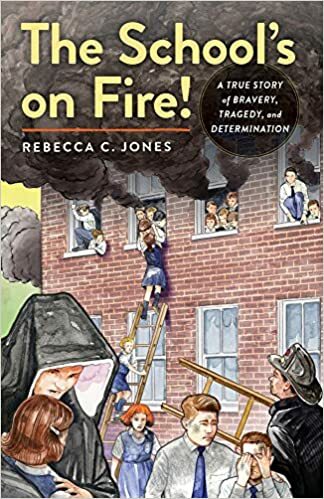 Cons: The cover picture is kind of odd, particularly the weirdly creepy nun in the foreground, and doesn’t really convey the full extend of the tragedy.